One of the most creative uses of data-driven strategy and programming aligned recently with one big astronomical event- the Solar Eclipse. While everyone across the country was excited about this very cool event - Ryan Bersani and the team at the MIT Alumni Association took it to the next level by leveraging the opportunity engage with and have a special connection with alumni outside of some of their traditionally focused regions. Ryan, MIT’s new Director of Engagement Analytics, had already taken a personal interest in the eclipse and the excitement around it early on. So he jumped at the opportunity when a coworker walked into his office and mentioned wanted to do something special around this event. Now I want to pause for a second to stress Ryan’s title - the Director of Engagement Analytics. This amazing title alone shows that this team is invested in the power of data and it’s growing role in the everyday relations role. Knowing that there would be a limited budget for this new, unplanned initiative, the team at MIT knew data could help them be specific with their targeting and impact. The goal was to send MIT branded solar eclipse glasses to those alumni who were in the path or close enough to most likely travel to see the event. Ryan was able to geographically plot their alumni base across the US leveraging the mailing addresses in the alumni database. This practice is done frequently to determine best locations for the event, alumni groups and other initiatives in highly alumni populated areas. Pythagorean Theorem to determine the relations of the alumni to these points. This was modified because the curve of the earth would throw off some of the long-distance calculations. 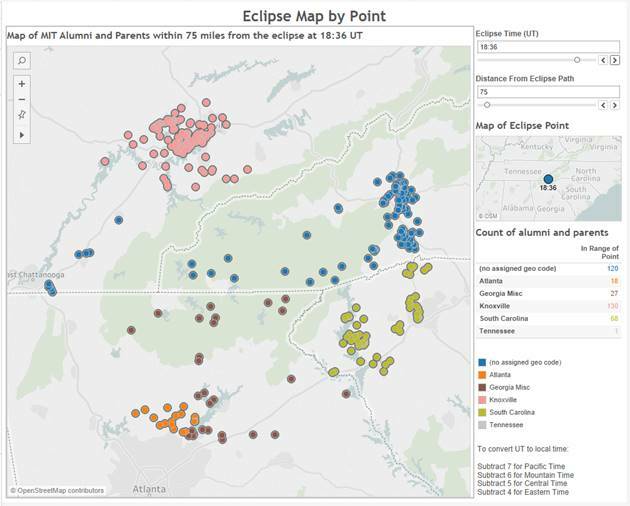 From here, Ryan made an interactive map to plot the closes alumni and parents to look at views of alumni within 50 miles of the Path of Totality. From here they could refine the distance to determine who to send the glasses they were allocated in their budget knowing the closer they were to the path, the more likely they were going to get used out of the glasses! The map included data points with the alumni unique IDs, latitude, longitude, “geocode” (for club information), affiliations, the value of the minimum distance and a time conversion to the time they were closest to the Path. The “geocode” was added in so that the Regional Club Managers could also use the tool to reach out to the clubs to send club region pictures and support any of the events that were going on regionally around the Eclipse. The interactive map also allowed for some great visuals for their social and online content stories focusing on the initiative and hype around this national event. There are a few reasons we were super excited to highlight this initiative here at Tassl. It made data cool. Data can help power and drive both strategic and creative initiatives and we love to geek out with people who are using data in these ways. It was a team project. For this initiative to be pulled off, collaboration had to happen between regional clubs, the MIT events team, the travel program, communications and data teams. With all the other priorities and initiatives going on, we know this isn’t always the easiest task. The MIT Alumni Association was able to do this so successfully because the whole team was brought together and working towards the same goals. It leveraged strategy. While this graphical data looked cool (because it was), it wasn’t just data for the sake of looking at data or used for an internal presentation update. It was used to drive strategy. Ryan stressed with us that he is continually using data like this to show the value add and highlight where it can have the most impact on the alumni association. It expanded their reach. The initiative was a creative way to reach an alumni audience outside of their typical focus regions, allowing MIT to expand their reach and connect with more alumni in meaningful ways. You don’t have to wait to explore initiatives like this one until the next solar eclipse in the US in April of 2024. Location-based data points can be used in a variety of other ways to meet your engagement goals and be more strategic with where you are placing initiatives like events, regional chapters and even direct mail pieces with your alumni networks. Feel free to connect with Ryan Bersani on Linkedin!